At Easter time, the shops are packed full of hot cross buns – and it seems that every year there’s something new on offer. 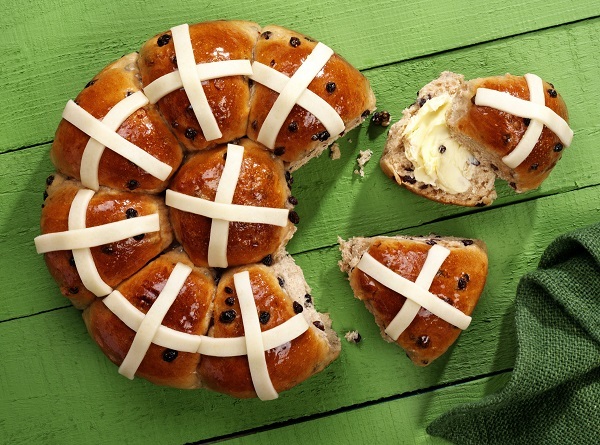 This year, you’ll find brioche hot cross buns in Aldi, chocolate and toffee buns in Tesco…and M&S have everything from carrot cake hot cross buns with a cream cheese centre to savoury cheese hot cross buns for 2017. While there’s nothing wrong with buying your buns, making your own will give you a real sense of satisfaction. And it’s easier than you may think, too – Dr. Oetker have shared their tear and share bun recipe with us – let us know if you give it a go this year! 1. Grease and line a 23cm (9inch) diameter spring-form cake tin with baking parchment. Mix the flour, cinnamon, dried yeast, salt and light brown sugar together in a large mixing bowl. Make a well in the centre. 3. Gradually pour and mix in the remaining milk, stirring to form a slightly sticky, moist dough in the centre of the bowl. 4. Turn the dough on to the work surface and knead until smooth and elastic, and the dough no longer sticks to the work surface and is silky smooth; this will take about 10 minutes. Only use extra flour to dust the work surface or your hands if the mixture is very sticky – the longer you work the dough the less sticky it will become. Push any loose currants back into the dough as you knead. 5. Put the dough in a large, lightly oiled bowl, big enough to allow room for the dough to double in size. Cover with a clean tea towel and leave to rise at a cool, room temperature, out of draughts, for 2 ½ to 3 hours or until doubled in size. 6. Once the dough has risen satisfactorily, push the dough with your knuckles to deflate it and turn it on to a lightly floured work surface. Form the dough into a ball and let it rest for 5 minutes on the work surface. 7. Divide into 9 equal portions and form into balls. Place one in the middle of the tin and arrange the others round the edge of the tin. Cover with oiled cling film and leave in a warm place for about an hour or until doubled in size. 8. Preheat the oven to 200˚C (180˚C fan assisted oven, 400˚F, gas mark 6). Brush the reserved egg all over the buns. Bake for about 30 minutes until richly golden and the buns sound hollow when tapped. Cool in the tin for 10 minutes. 9. Meanwhile, prepare the decoration. Put the milk in a saucepan with the caster sugar. Heat gently, stirring until dissolved, then bring to the boil and simmer for a few seconds until syrupy. 10. Carefully unclip the tin and transfer the bun round to a wire rack. Brush generously all over with the sugary milk glaze and leave to cool completely. 11. To serve, lightly dust the work surface with icing sugar, roll out the marzipan thinly and cut out 18 1cm (1/2inch) wide strips approx. 6 to 7cm (2 ¾ to 3 inch) long for the crosses. Lay 2 strips, crossing, over each bun and press down gently. Your hot cross buns are now ready to serve and enjoy. These buns are delicious eaten on the same day they are baked, split and spread with butter, or cut in half and lightly toasted. They will keep for a couple of days if stored in an airtight container. Replace the currants with any dried fruit of your choice, or for a flavour twist, add a 100g bag Dr. Oetker Dark Chocolate Chips instead of the fruit. If you’re not a Marzipan fan, why not use strips of Dr. Oetker Regal Ice to make the crosses instead, or pipe the crosses with Dr. Oetker Designer Icing. More traditionally, the crosses are piped onto hot cross buns before baking. Mix 50g (2oz) plain flour with 20ml (4 tsp) vegetable oil and about 30ml (2 tbsp) water to make a smooth, stiff paste, suitable for piping. Spoon into an uncut piping bag until ready to bake. Glaze the buns with the reserved beaten egg as in the above recipe. Snip off the end if the piping bag to make an opening about 6mm (1/4inch) and pipe a cross on top of each bun. Bake as above and then brush them with sugar syrup.